SURPRISE! You’re Already Doing Yoga! As I meet more and more parents and caregivers, I notice the reaction on their faces when they tell me their challenges, and the solution I give is yoga. I read their faces as “yeah right, how is standing on my head going to help my child! ?” Yoga brings on tolerance, acceptance, trust, physical health, patience and love for all, including your challenging child. I am here to tell you, just by breathing you are already doing the most important part of yoga. Now you can be mindful of how you breathe. I recently spoke to a Dad, who lives in the midwest. He casually asked if I could make some video clips and show him how to do yoga so he can do it with his adult son who is on the Autism spectrum. He has no opportunities to do yoga where he lives. He went on to tell me what he does to make himself feel better, most of what he naturally does is yoga. He inspired me to write this blog. Every one takes a deep breath once in a while. Everyone does some form of praying out loud, whether it be in a church, synogogue, mosque, temple, alter, or in traffic. Saying what you want out loud repeatedly is important and is a part of the yoga I know. Most of the time we have no idea what we are doing to our bodies when we are practicing. Sometimes my goal is “just get to class.” There are absolutely times where I literally drag myself there. 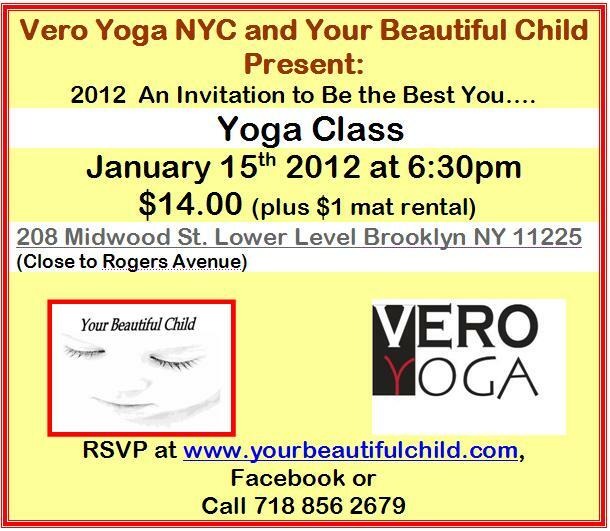 If you live in Brooklyn, on Januaray 15th at 5pm you will have a wonderful opportunity to begin a yoga practice at VeroYoga. Vero Yoga is located at 208 Midwood Street, the lower level in Prospect Lefferts Gardens. Linda Gastaldello will be teaching a beginners hatha, vinyasa class. The price is $14.00, bring a mat or rent one for $1.00. Namaste and I hope to see you on the mat!